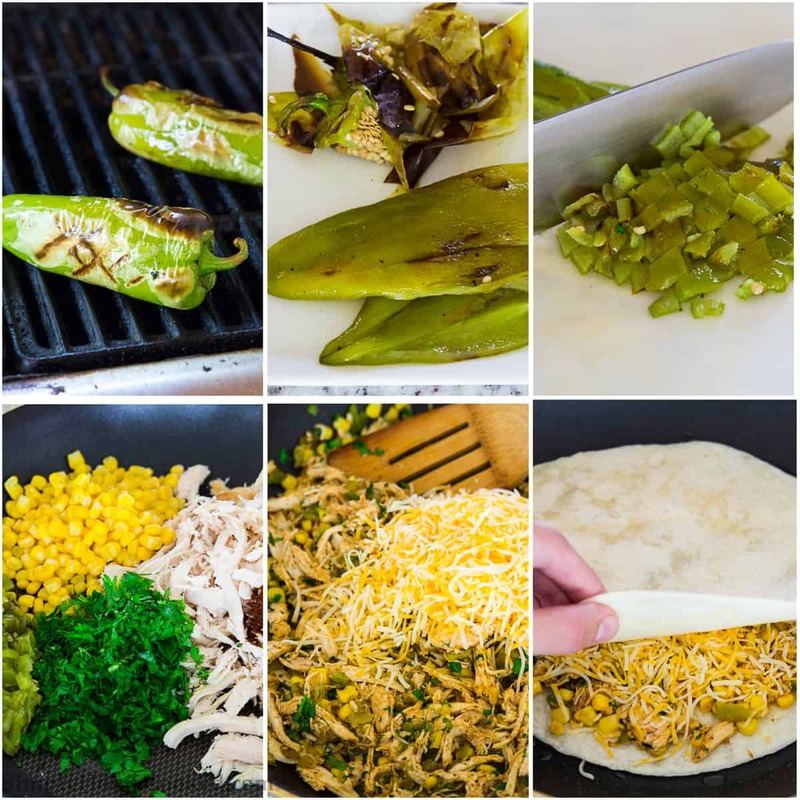 Take your basic chicken quesadillas to a whole new level with these in-season grilled hatch chilies. Grilling your own chilies is totally effortless and oh so tasty! Since hatch chilies are in season now, grill more than the recipe calls and can them. That way you’ll have these seasonal goodies throughout the year. 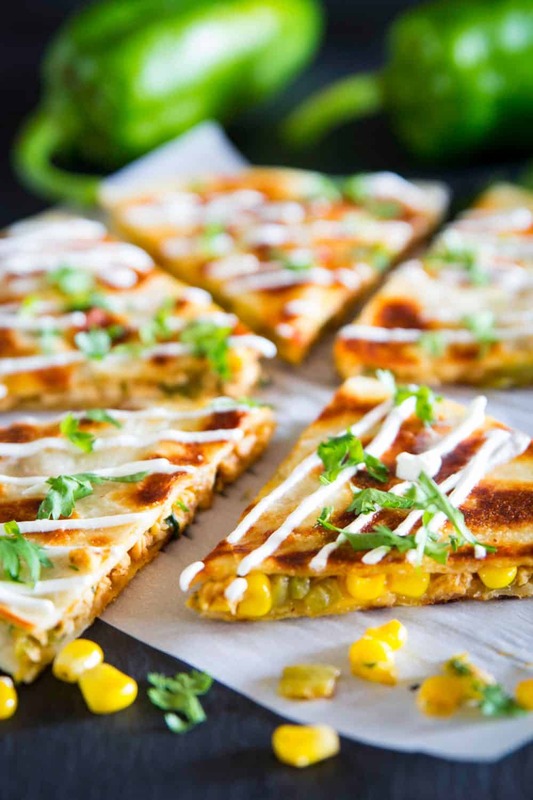 These quesadillas are a quick and easy dinner idea for even the busiest weeknights. 1 . Fire up the grill on medium high. Once it’s hot, rub 1 tbsp olive oil over each chili pepper and place it on the grill. Turn once after 4 minutes. Then grill for an additional 3 minutes. 2 . Remove the hatch chilies from the grill. Then peel the skin and discard the seeds. Using a sharp knife, finely chop the 2 peeled chilies. 3 . In a pan, heat the remaining 2 tbsp olive oil over medium heat. 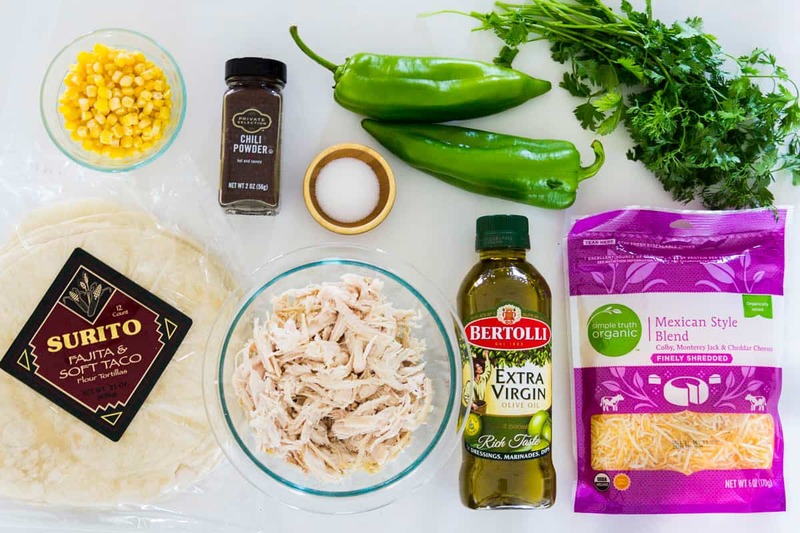 Add the shredded chicken, chili powder, salt, chopped cilantro, corn, and 1 cup shredded cheese. Stir for a few minutes or until well combined and the cheese is melted. 4 . Spread 1/4 of the chicken filling on a flour tortilla and sprinkle and additional 1/4 cup shredded cheese on top. Grease a separate pan with a tiny bit of olive oil and place the tortilla on it. Then place another flour tortilla on top. 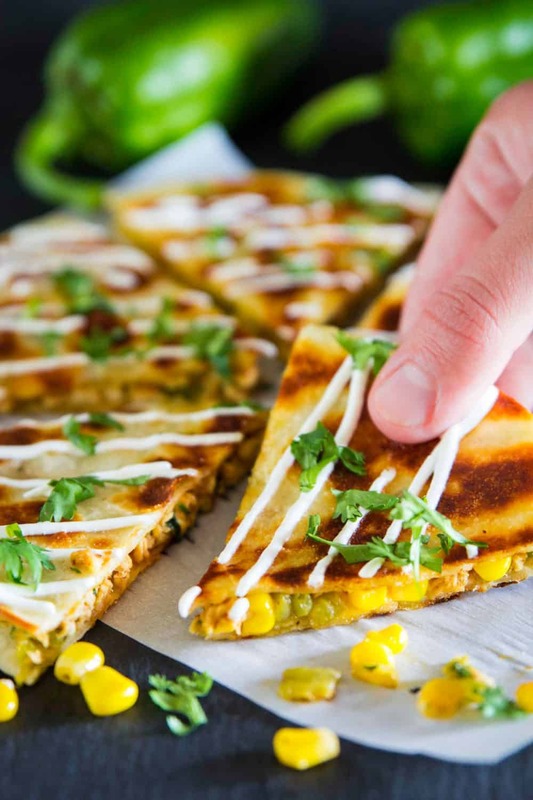 Cook both sides of the quesadilla on medium heat until golden brown. About 1-2 minutes per side. Serve hot with sour cream and/or salsa. Fire up the grill on medium high. Once it's hot, rub 1 tbsp olive oil over each chili pepper and place it on the grill. Turn once after 4 minutes. Then grill for an additional 3 minutes. Remove the hatch chilies from the grill. Then peel the skin and discard the seeds. Using a sharp knife, finely chop the 2 peeled chilies. In a pan, heat the remaining 2 tbsp olive oil over medium heat. Add the shredded chicken, chili powder, salt, chopped cilantro, corn, and 1 cup shredded cheese. Stir for a few minutes or until well combined and the cheese is melted. Spread 1/4 of the chicken filling on a flour tortilla and sprinkle and additional 1/4 cup shredded cheese on top. Grease a separate pan with a tiny bit of olive oil and place the tortilla on it. Then place another flour tortilla on top. Cook both sides of the quesadilla on medium heat until golden brown. About 1-2 minutes per side. Serve hot with sour cream and/or salsa. Woahhhhh woah woah do these look amazing!? Haven’t even tasted these and I’m already obsessed! I have a feeling these might be a new family fave. Thank you Karly! I hope you all enjoy them! Dina, exactly how spicy are those peppers? I love that this recipe calls for rotisserie chicken! It’s so easy. It really depends on the peppers. Generally they should be pretty mild. The ones that I bought weren’t spicy at all.